The Cascade Microphones FAT HEAD Ribbon Mic Matched Stereo Pair Kit with Cloudlifter CL-2 Mic Activator from B&H comes with everything you need to get started making pristine professional recordings in a variety of stereo miking configurations for vocals and instruments. The kit comes with a matched pair of Cascade FAT HEAD Ribbon Microphones that comes with a stereo Blumlein bar, Cloud Microphones Cloudlifter CL-2 Mic Activator, a microphone stand, and two XLR cables. These FAT HEAD Ribbon Microphones from Cascade Microphones are sold as a stereo matched pair and are versatile enough to handle almost any vocal or instrument recording, and live sound application. The FAT HEAD features a hand-tuned ribbon element that incorporates the legendary symmetrical ribbon design in order to achieve a true symmetrical figure-8 polar pattern. Its frequency and sensitivity response are engineered to deliver pristine audio results, and the element's design is very useful when executing a mid-side or Blumlein recording. 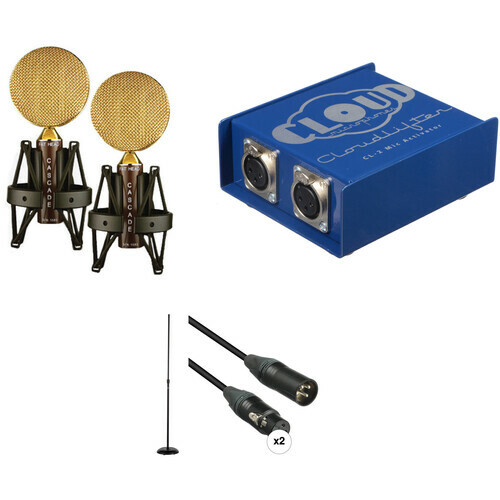 The Cloudlifter CL-2 Mic Activator from Cloud Microphones is a compact, dual-input solution for common audio problems in the field and in the studio involving low-output passive microphones, including ribbons. The CL-2 uses any standard phantom-powered mixer or microphone input device to provide up to +25 dB of clean, transparent gain. This improves signal-to-noise ratio and improves the performance of passive microphone signals by driving stronger, cleaner signals over longer XLR cable runs, making them ideal for broadcast, live, and studio applications. The CL-2 is housed in a rugged steel enclosure which offers shielding and durability. The Atlas MS10CE Leader series microphone stand features a round cast iron base with an adjustable height bettween 35 - 63". Box Dimensions (LxWxH) 17.1 x 12.9 x 4.7"
Box Dimensions (LxWxH) 5.75 x 5.35 x 2.4"
Box Dimensions (LxWxH) 33.0 x 16.0 x 3.0"
FAT HEAD Ribbon Mic Matched Stereo Pair Kit with Cloudlifter CL-2 Mic Activator is rated 5.0 out of 5 by 1. Rated 5 out of 5 by Kenny Winker from Good to go This is a great bundle. I already had cloudlifters and I was just going to buy the matched pair of Fat Heads until I saw this package. Everything arrived quickly and undamaged by delivery. The xlrs are good and the mic stand feels sturdy like it will last in a busy studio. The CL-2 provides plenty of gain for the Fat Heads. I've tested them through 3 different preamps and I've had no S/N issues.